Once again we had a full house for Coffee with the Poets at Cafe Touche' in Hayesville. 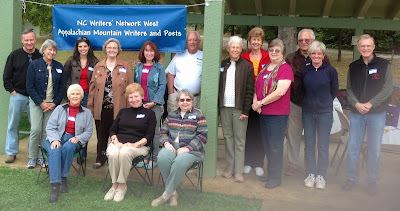 Joan Howard of Hiawassee and Athens, GA was one of the featured readers. Bob Groves agreed to be photographer for the day and the following are some photos he made of those who enjoyed the social aspect of the morning. Bob Grove reading at open mic. He gave me the camera while he read.